On July 2 2018, state govt. evicted 73 houses from Reserved Forest Area of Nongmaiching Chingkhong. among this 9 members of 3 families had told the police that they were from Tripura. A paper reported the number as 21. When police contacted Tripura one among them turn out to be an absconder involved in a crime against woman. Others could not be traced out as they are either Bangladeshi and the Rohingya. On 28 May 2018 a Rohingya spouse with their 8 months old son was arrested at Mao gate while entering the state. Tbey procured refugee card issued by the UNO and they may be from Jammu and Kashmir side. 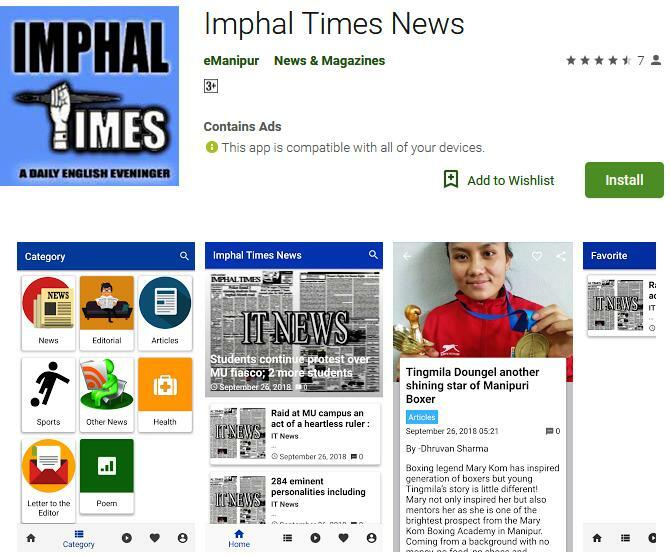 On May 24, 2018, 3 Muslims from Myanmar who procured Adhaar card issued from Uttar Pradesh were arrested at Tengnoupal while coming towards Imphal from Moreh. On May 21 , 2018, 3 Rohingya girls were picked up from a rented house at Khurai Konsam Leikai and handed over to Police by the locals. On May 21, 2018, 8 Rohinya were arrested from a rented house at Minuthong Hatta . all showed fake Adhaar card qnd procured refugee documents issued by the UNO. One woman from Moijing in Thoubal who brought them here in the state was also picked up by the police. These people had entered from Mayanmar to Bangladesh and from they stayed for some times at Refugee camp in Jammu and Kashmir. On May 13, 2018, 9 Rohingya who entered through Moreh were arrested along with a Muslim lady from Chennai. All the 9 Rohingya procured fake adhaar card. On May 10, 2018, 24 Muslim who entered to Tripura from Bangladesh were arrested by Tripura police. On May 1, 2018, four Rohinya were arrested at Moreh while trying to enter from Mayanmar side. On April 27, 2018, police arrested a Bihari Muslim from Wangoi market. The person had an Adhaar card with address at Lilong. On 10 April, 2018, one Rohingya was arrested from Moreh by Tengnoupal police. On March 21, 2018, 3 Rhingya who stayed at Moreh for some times were arrested by the police. On February 1, 2018 3 Rohingya were arrested while trying to entered at Jiribam . All have fake adhaar card. On Jan 16, 2018 Tripura police arrested 6 Rohingya from Dharam Nagar in Tripura. On December 22, 2017, Chief Minister N Biren had informed the state assembly that one Rohinya was arrested at Jiri while 7 had escaped towards Manipur. The CM further said that 560 outsider were arrested among them 105 had been force to return back. 178 illegal immigrants were arrested from Jiribam alone. Besides a makeship bridge constructed across Jiri River suspected as a route for Rohingya was also dismantled, the cm added. On November 29, 2017, 8 migrants suspected to be Rohingya Muslim were arrested who entered from Myanmar to Bangladesh and later sneaked to Tripura were arrested from Khayerpur in West district of Tripura. On November 2 , 2017, 18 Suspected Rohingya were handed over to police by locals of Adamnagar in Tropura. They all possessed adhar card from Murshidabad in West Bengal . They told that they passed through Bangladesh to enter Tripura which is hard to believe . It cannot be ruled out that they are Rohingya who is trying to enter ManipurOn October 4, 2017 six Rohingya Muslim who entered from Myanmar through Bangladesh to India were arrested from Karimganj of Assam . 3 other muslim who help them entered to India were also arrested by the Assam Police. On September 21, 2017, A britsih citizen Samiun Rahman , who is also a member of the Al Quaeda was arrested from New Delhi. He had stayed in Dhaka Jail for extortion related case and was released April of the previous year. He revealed that Alqaeda based are being set up at Kishanganj, Haribagh and Mizoram and Manipur of North East India. On September 14 as reported by a journalist Prasanta Mazumdar Chief Minister N. Biren said that a total of 25 Rohingya were detained in judicial custody. On August 21, 3 Bangladeshi Muslim were arrested in Belona of Tripura by Tripura police. On April 18 , 2018 , 9 Bangladeshi immigrants were arrested in Tripura, those arrested procured fake Indian Adhaar card, voter cards as well as bank pass book. On July 30, 2017, during a clashed among prisoners at Manipur Central jail 2 Muslim citizens of Saudi Arabia and a Manipuri were killed. The 2 Saudi citizen were arrested while entering from Moreh side on June 16, 2013 by Assam Rifles troop from tengnoupal. On July 17 , 2014 a journal called First World has reported that 23 Muslims from lilong area have been recruited to Al Qaeda. On September 2 , 2012 Police announced that 60 people trying to enter the state without proper valid document were force back to where they came from. On August 20 , 2007 , Assam Rfiles arrested 15 migrants from Moreh Ward No. 3. Among them 6 were suspected member of the Al Qaeda. 10 were from Bangladesh and 5 were from Myanmar. On December 19 , 2006 for the first time 3 meitei Pangal, who were members of the Lashkar –e-Toiba were arrested along with arms from New Delhi. The above statement was released by Alliance for Social Unity , Kangleipak (ASUK) which were collected from newspaper sources. A statement signed by the Chairman of ASUK N. Oken and Vice Chairman Ksh Laba Meitei appealed to ponder on the reality of the influx of illegal influx to the state of Manipur. The statement said that those reported cases are only reported one in newspaper but there are possibility of other unreported cases. It is now a fact that illegal migrants had entered the state and continue to sneak using any mean. Before 2000, those influx in the state are Nepali, Bangali, Bihari and Deshwali etc. now the trend has changed today’s illegal migrants are Bangladeshi Muslims and Rohingya Muslim. The statement said that the entry of Rohingya was not due to survival struggle arises from the crisis between Myanmarese and the Rohingya at Rkhine state as the location is far from the state of Manipur. Their entry to the state have some agenda, the statement pin pointed. The statement also elaborated on the modus operandi on how the Rohingya entered the state of Manipur. They were helped by agent to bring upto Jiri or Moreh from either Bnagldesh or Mayanmar and among the agents 99% are from among the Muslim community (Meetei pangal). Stating on why the some meetei pangal brought the foreign muslim to the state the ASUL statement stated that it was due to the influence of politics that some felt it necessities. The Meitei Pangal came to the state some 500 years ago. There number was only 30 to 40 . they married the Meitei women and spread their community . Their only differences with the Meitei is the religion- language and the culture were similar among the meetei pangal and the people of the state. Hindu Goudiya, Sanmahisam , islam, Christianity, Budhism and atheist built the Manipuri community which means that the Meetei pangal are ethnic Meetei.